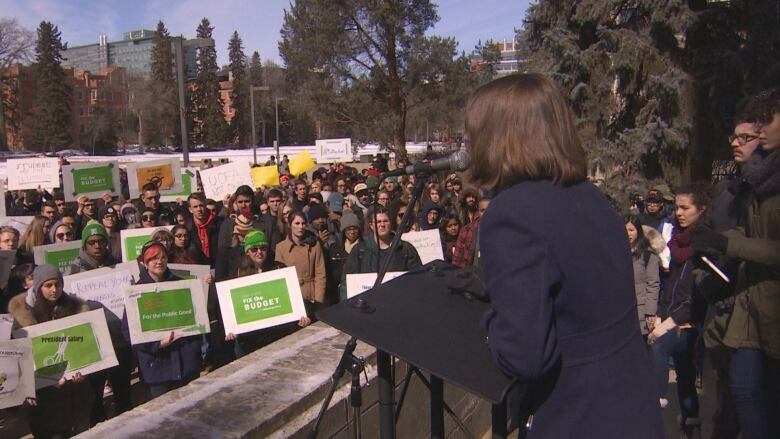 Student protesters held signs and rallied against the University of Alberta's increased fees for international students and residents. On a chilly Friday in the University of Alberta quad, close to 200 people — students, staff and faculty — protested against budgeted increases to fees for international students, residence rent and meal plans. "U of A! Not OK!" they chanted as speeches were made from the steps of the South Academic Building. The fee increases were approved by the university's board of governors on March 16.
International students will have to pay 3.14 per cent more for tuition, students living in residence will pay four per cent more for rent and meal plans will go up by 15.8 per cent. "I do not love the board of governors and I do not love the decisions that were made on our behalf when we told them we do not want the meal plan," Caspian Teymouri told to the crowd. "We do not want the rent increases. We do not want to the tuition increases for international students. This is unacceptable." Teymouri is an economics student who lives at Lister Hall and will be affected by both the rent and meal plan increase. He's a domestic student, but he worries that friends who are international students may transfer elsewhere. 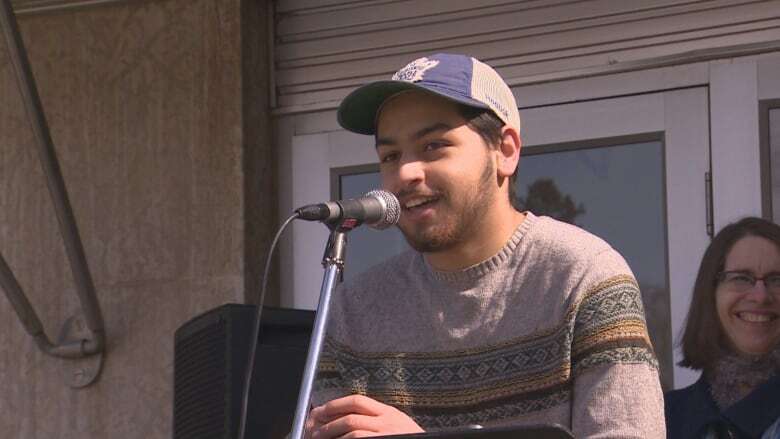 "If you're an international student living in Lister, odds are you're going to rethink coming back next year," said Teymouri. "So that'll affect me in the way that I might lose some of the greatest friendships I've ever made." Akram Hammami, president of the international student association, is in his fourth year of secondary education. As a student from Tunisia, he says international fees have increased each year. This latest increase will cost him an additional $800. "As an international student, all the increases ... those are translated into more jobs," Hammami said. "You need to find multiple jobs to work multiple hours. You won't have enough time for school. Your grades will be going downhill." U of A president David Turpin was not at the protest. When reached by CBC News, he noted that the Alberta government does not cover international fees and residence rent. "None of us like increased fees. We don't like paying increases in taxes," said Turpin. When our grocery bill goes up we don't like it. When the cost of gasoline goes up, we don't like it." "Our international fees are among the lowest in Canada. Our residence fees are very, very affordable in comparison to our comparative set of universities.The fees that are being charged at the University of Alberta are well below the national average." According to Statistics Canada data, international students in an arts and humanities program at the undergraduate level faced fees of $20,395 this year at the University of Alberta and $18,338 at the University of Calgary. Many of the protesters are calling for Turpin and the board of governors to revisit the budget. When asked if that was possible, Turpin said they could look at the fees for the upcoming budget, which would be a year from now. Nonetheless, protesters say they will keep doing what they can to be heard, including putting up posters around campus and holding rallies. Said Teymouri, "We have to be loud because they've clearly shown they don't want to listen to us, so we have to make them."